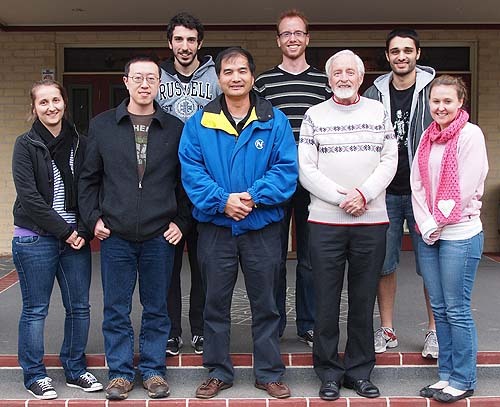 Dr Roger Parish obtained his PhD in biochemistry from Melbourne University. He then worked at the CSIRO Division of Protein Chemistry before moving to the Federal Institute of Technology (ETH, Zurich) and the University of Zurich where he worked for 20 years. He took up the Chair in Botany at La Trobe University in 1987. He has held a number of administrative positions including Head of Department, Head of School, Dean and Pro Vice Chancellor. He was Acting Vice Chancellor in 2007. He was appointed Charles La Trobe Professor in 2011. Dr Song Li obtained his PhD degree in molecular biology and biochemistry from University of Texas at Houston. He then joined Botany at La Trobe University where he has worked with Prof. Roger Parish for the last 20 years. He is now a Senior Research Fellow supervising Honours and PhD students. Ross Napoli - Gene regulatory pathways in developing trichomes and seed coat of Arabidopsis thaliana. Reg Seyit - Genes rapidly induced following cold treatment of Arabidopsis thaliana cells. Yue Xu - The MYB80 gene and its role in pollen production in Arabidopsis thaliana and Brassica napus. Erica Wright - The induction by cold of the Arabidopsis thaliana dehydrin gene XERO2. Amber Gomersall - The effects of the Mycoplasma hyorhinis protein p37 on gene expression in mouse fibroblasts. Amila Avdic - Genes regulated by AtMYB5 involved in seed coat formation in Arabidopsis thaliana. Patrick Allen - Genes regulating seed coat development in Arabidopsis thaliana. Barbara Dinsdale - The role of RhoC in the invasivity in vitro and in vivo of mouse mammary tumour cells.